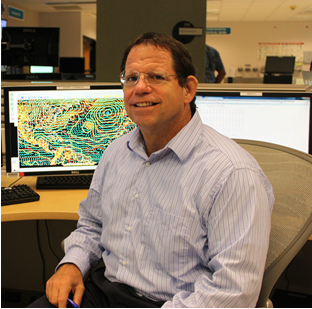 Q & A with NHC - Craig Mattocks, Ph.D.
You're the new guy around here. Yes, I worked at NHC as Chief of Computer Operations some time ago. In my new position, I am a member of the Technical Support Branch, and I will be doing a little bit of everything. Does your new position at NHC require a love of meteorology? Yes, absolutely. One of the things I will be doing is transitioning new research applications into operations. So loving and knowing meteorology will help me understand how these applications work. Was it an early interest? I started to love meteorology when I was a teenager. I grew up surfing along the North Carolina coast, sometimes in high wind conditions. I learned to understand and appreciate the power of nature when I got hammered by waves and held underwater for several minutes at a time. You learn to go with the flow of the ocean, to "surf the chaos" and keep your wits about you. Otherwise, you would drown. You also develop a deep love of the ocean and the atmosphere, which makes you want to protect the environment from harm. Is that your academic background? I earned my Bachelor of Science degree is in mathematics from the University of North Carolina (UNC) in Chapel Hill. I went on to get my Ph.D. in Meteorology and Physical Oceanography at the University of Miami's Rosenstiel School of Marine and Atmospheric Sciences (RSMAS) on Virginia Key. As a graduate student, I was developing numerical weather prediction (NWP) models. My first experience was working on a model that later became the RUC (rapid update cycle) model. It was a different sort of model, framed in dynamic, isentropic vertical coordinates, one in which the air flows along material surfaces like layers of Jell-O squishing between sheets of plastic food wrap. (You can tell we were starving grad students!) As part of my research, I flew in one of the NOAA P-3 hurricane reconnaissance aircraft, probing lee cyclones developing in the European Alps. It was a good way to get my feet wet in meteorology. How did you wind your way here? After graduate school, I began working for a private company, which was exciting. I developed high-resolution weather modeling systems for the U.S. military and for NASA's Kennedy Space Center to prevent the space shuttle from getting struck by lightning during launch operations, but I wanted to get back into research, so I returned to the University of Miami. At first, I worked on an isopycnic (density) coordinate ocean model known as MICOM (now HYCOM). We were tracking the trajectories of Cuban rafters who were escaping from Cuba and crossing the fast-flowing Florida Straits. It was an interesting project scientifically but you also realize that you're dealing with live human beings who are in grave danger and being rescued by the U.S. Coast Guard in treacherous waters. Later, as part of the Florida Everglades Restoration Project, I simulated how changes to the land surface from commercial development and urbanization generate microclimates over the Florida Peninsula that alters the rainfall pattern. Due to an illness in my family, I had to return to North Carolina for a while. I worked at UNC setting up a real-time, event-triggered numerical storm surge prediction system for the state of North Carolina. Afterwards, I was able to come back to Miami and I started running real and idealized numerical model simulations of hurricanes on some of the world's fastest supercomputing clusters. Fun! What is your single greatest challenge right now? The most exciting task will be transitioning new scientific technologies and applications from academia into operations as part of the Joint Hurricane Testbed (JHT) and the Hurricane Forecast Improvement Project (HFIP). This doesn't happen overnight — it's a multiyear process to transform a new idea or a prototype application into an operational forecasting tool. I want to modernize some aspects of weather forecasting as much as I can, creating new products and turning some of the current text products into more graphically-oriented products. Some of these text products are overwhelming. I have learned from shadowing the forecasters in TAFB (Tropical Analysis and Forecast Branch) that you can't describe an entire marine system in just a few words. The forecasters try really hard to divide the ocean into smaller domains and provide details on what's happening for mariners. But to really see and understand the ocean, winds and waves, users need to be working with new sources of gridded data. TAFB forecasters are using an innovative tool, the Graphical Forecast Editor (GFE), that lets them infuse their forecasting intelligence and experience into the gridded model output fields. A recurring question is why we use all uppercase letters in our text products. Any chance the lowercase letters can be used? I hope we can eventually move beyond text products — start developing augmented reality (AR) applications and blend some of the new technologies with these forecast products so people can actually lift a simulated weather system (like a hurricane) out of the page or web site and look at it in detail. It will be an immersive 3-D experience, spinning the storm or weather feature around in your hands and examining it from all directions. These technologies are coming soon so it's going to be an exciting period ahead for the development of weather forecast products. I like running along the beach, lifting weights, working Sudoku puzzles and reading scientific magazines. Hopefully, doing all I can to help the Hurricane Specialists and marine forecasters see things in new, innovative ways to make the best forecasts possible.